The Capital Region has long been recognized as a national leader in cleantech innovation and green jobs. For example, a 2011 study by the Brookings Institution and the Battelle Technology Partnership Practice found that the Albany-Troy-Schenectady metropolitan statistical area (MSA) had, among the nation’s 100 largest MSAs, the highest concentration of clean economy jobs. In 2017, another Brookings study found the Albany-Schenectady-Troy MSA had generated the second greatest amount of wind energy patents, and 14th most solar energy patents, in the nation between 2011 and 2016. In 2018, ZipRecruiter ranked the Albany-Schenectady-Troy MSA 20th for Best Opportunity for Employment on Renewable Energy. As this Earth Day Special Edition of the CEG Indicator also highlights, in 2018 Capital Region inventors were listed on more than 200 patents for technologies or applications for mitigation or adaption against climate change. Below are profiles of businesses that are contributing to the robustness of the Capital Region’s clean economy and to the fight against climate change. 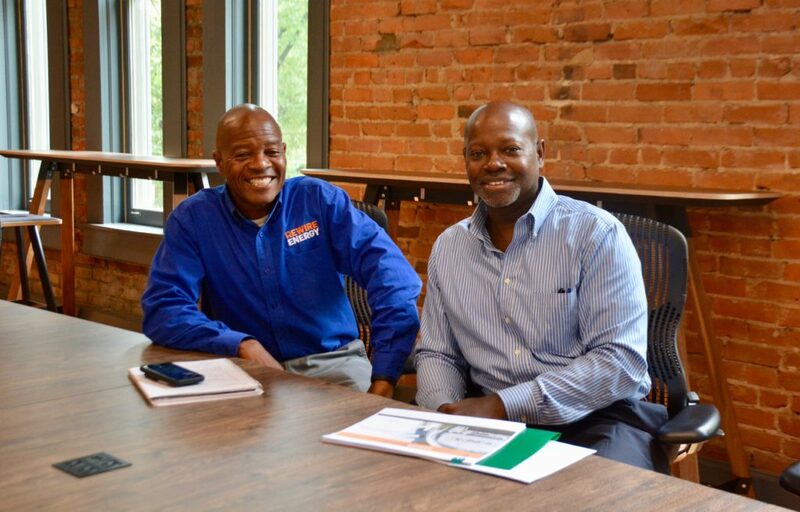 Brothers Lee Evans (left) and Al Evans (right) lead business development and marketing and digital strategy for ReWire Energy. ReWire is a family-owned, New York State certified Minority Business Enterprise (MBE), focused on delivering zero energy building solutions. Five brothers and their father, Milton Evans Sr., a retired General Electric chemist and strategist, launched the firm in 2015. Drawing the brothers together for this green energy venture was Warren Evans, a former nuclear engineer and graduate of Rensselaer Polytechnic Institute and the Stevens Institute of Technology. Warren, who is based in the Philadelphia area, had taken a great interest in solar power and spread it to his brothers in the Capital Region. “We believe there’s a positive ROI for companies who make this kind of investment,” said Warren. ReWire’s initial focus was on energy efficiency and solar installation for residential buildings, but its reach has expanded to commercial developments, such as The Link@SoBro and municipalities. ReWire worked with the City of Schenectady in applying for a New York State Energy Research and Development Authority (NYSERDA) grant for software to support a peer-to-peer energy platform. The software will allow the city, utilities and electric vehicle (EV) station owners to share parking and charge revenues as EV stations replace parking meters. Comply/exceed building codes or local energy plan expectations. “We know everyone is not going to get to net zero. We want to move them along in that direction because of the overall benefits that accrue for all stakeholders,” said Lee Evans, ReWire’s business development and sales manager. Start working on your community solar, commercial zero energy or municipal smart energy project today by contacting ReWire Energy at 518-290-3130 or sales@rewireenergy.com. 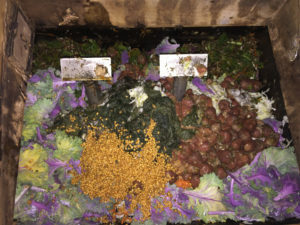 Before and after pictures of food waste in Biosoil Farms’s “fooderator,” the Ecovim. In 2017, Ecovim, an Ontario, California company, approached Chad Currin, about conducting research on its namesake product, the Ecovim. It is a 250-pound food waste dehydrator system that Currin calls “the fooderator” and that looks like an industrial dish washer. Capable of decomposing and macerating 1,000 pounds of wet food waste into 200 pounds of sterile, mulch-like biomass, Ecovims are commonly used at U.S. military bases that must haul food waste off site. At the Glenville Industrial Park, Currin’s BioSoil Farm was far removed from a military base, and food recycling was an application very different from the business’s primary focus of producing worm casting products for gardens and farms. However, Ecovim was hoping Currin could unlock the value in its equipment’s commonly discarded powdered food waste, just as he had with worm castings. “There was a little bit of secret sauce to make that happen,” said Currin. After a year of research, Currin developed a proprietary method for using the Ecovim to turn its powdered food waste into a low-dose, high-efficiency fertilizer and pellets capable of producing 20 percent more energy than their wood counterparts. And with the support of the Center for Economic Growth (CEG), which assisted Currin in obtain a $12,500 Workforce Development Institute grant so he could purchase the equipment that Ecovim had loaned to him for the R&D, BioSoil Farm has vastly expanded its menu of products and services. Using food waste from Schenectady County Community College’s culinary program and from Capital Region food banks and pantries, BioSoil Farm is making fertilizer and pellets to support its new industrial hemp operation. The fertilizer, in combination with worm castings, are used to grow hemp while the pellets provide energy for the indoor operation’s grow lights. “All of these [products] seem disparate, but it all came together,” said Currin. “CEG helped out a lot. They allowed us to keep the research going on food waste cannabis waste recycling,” Currin said. 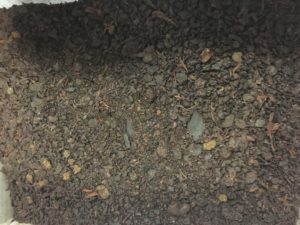 To learn more about BioSoil Farm’s food waste management and cannabis waste remediation and worm casings and other dry products, call 518-365-3886 or email sales@BioSoil.farm. 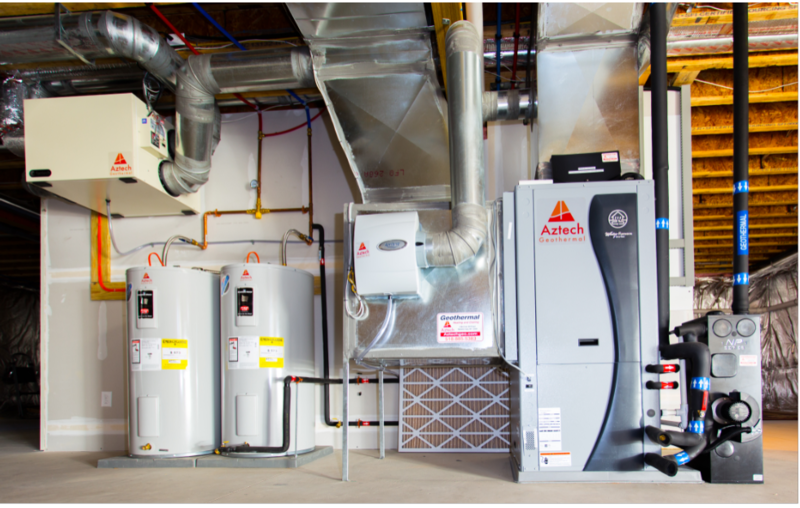 A geothermal heat pump system designed and installed by Aztech Geothermal for a 3,000-square-foot home in Saratoga Springs. The system fully heats, cools and produces hot water at 50 percent of the operating cost of a conventional system. In 2009 the Ballston Spa-based Aztech Geothermal installed its first geothermal heating system for a residential building in Saratoga Springs. The previous year had seen oil prices consistently above $100 per barrel and Congress’s passage of the Energy Improvement and Extension Act of 2008, which established a tax credit for geothermal heat pumps. These developments, coupled with the introduction of geothermal heat pumps with dual or multi-speed compressors that supported more efficient heating/cooling systems, set Aztech on a course that would enable the company to spread the technology throughout the Capital Region over the following decade. By 2019, Aztech had installed more than 450 renewable energy geothermal systems that not only deliver heat in winter but also removes it in summer. The systems consist of an underground network of plastic pipes that connect to a heat pump inside a building. A special water solution travels through the pipes and either carries geothermal heat into the building or releases heat from inside the building back into the earth. With fossil fuel combustion from buildings accounting for 38 percent of New York State’s greenhouse gas emissions – second to transportation-related fossil fuel combustion – Aztech is at the front lines of the fight against climate change. The company, which employs 14, is annually installing 40 to 50 geothermal technology systems at single-family homes in the Capital Region. Half of those houses are new construction and the other half are existing buildings. The greatest savings come from homes using heating oil or propane as their option, but still about 20 percent of Aztech’s customers have access to lower cost natural gas. Aside from the energy savings, customers install systems to lower their carbon footprint, especially when paired with renewable electricity from a PV solar array. Aztech has also installed geothermal heating systems at many Capital Region commercial properties, such as Oscar’s Smokehouse in Warrensburg and the Vischer Ferry General Store. “There are plenty of homes without natural gas in the Capital Region, so there’s plenty of work to do there,” said Aztech President John Ciovacco. Depending on the extent and quality of new or existing ductwork in a house, geothermal systems can range in price between $25,000 and $35,000. Under the federal Residential Renewable Energy Tax Credit, homeowners can receive a credit of 30 percent for geothermal systems placed in service by the end of 2019, and that credit will be gradually reduced to 22 percent through the end of 2021. The New York Energy Research and Development Authority (NYSERDA) also offers a Ground Source Heat Pump Rebate that is capped at $15,000 for single-family homes and $500,000 for commercial buildings. Ciovacco, who is also a founding member and interim director of the New York Geothermal Energy Organization (NY GEO), said National Grid will put in place a more extensive heat pump incentive program next year to replace the NYSERDA rebate program. He expects this “big shift” will help spread the utilization of geothermal heating systems in the Capital Region, because utilities already have relationships with building owners and are ideally positioned to raise awareness about them. “There’s a big change in the ways clean heating & cooling equipment incentives are coming to the customers,” he said. To learn more about how your residential or commercial building could benefit from a geothermal heating/cooling system, contact Aztech Geothermal at 518-309-2000 or info@aztechgeo.com.